Arthur A. Levine Books, 9780439368803, 40pp. Bud is a happy stinkbug, except when it comes to stinking contests. He always seems to lose to champions like P. U. 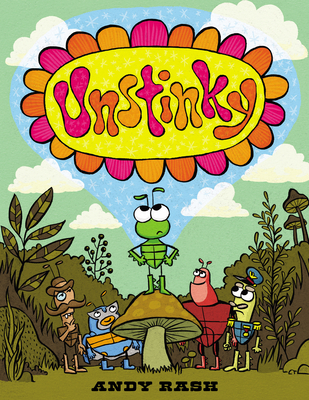 Bottoms, Lord Stinkington, and The Fumigator. Every time they make smells like OUTHOUSE, GYM SOCK, and ARMPIT, poor Bud ends up smelling like FLOWERS, or FRESH-BAKED BREAD, or CANDY CANE. Stinking just isn't Bud's THING. But what IS his thing? Andy Rash is the author and illustrator of several picture books, including The Robots Are Coming, Are You a Horse?, and Agent A to Agent Z. Andy’s illustrations have been featured in the New York Times, Time, Wired, the New Yorker, and other national publications, and his animations have been shown on Nickelodeon. He lives in Milwaukee with his wife and two children.